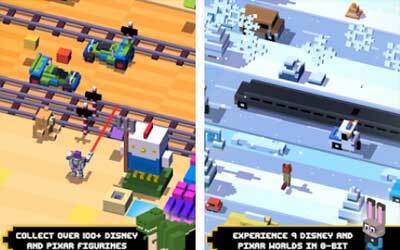 Disney Crossy Road APK has been released with the current version 2.300.13352. Still remember the Crossy Road? Games developed by Hipster Whale is indeed very simple, but very addictive. So far, it has been downloaded over 120 million times. Its popularity is so phenomenal make Disney interested in working together. From this cooperation resulted in Disney Crossy Road. They was still carrying the gameplay and graphics 8-bit the same as the original Crossy Road, here the player will meet with sequences of characters and thematic world taken from the property of Disney and Pixar. In total there are nine thematic world belongs to Disney and Pixar, for example, The Lion King, Toy Story, Inside Out, to the newest namely Zootopia. Its character numbering in the hundreds, including of course Mickey Mouse, Donald Duck, Buzz Lightyear, Mufasa, Wreck-It Ralph, Sadness and much more. But the world changes and the character just does not seem enough to make this game so alluring. There should be additional unique element. Well, every world which is played in this game has challenge and unique mechanism to refer to each of the original film. One example is when playing with the world setting Inside Out, precisely in Riley’s Long Term Memory. While hopping across the clouds incessantly, players will be challenged to collect “Memory Spheres” and put in “Memory Collectors” to gain extra points. Unique elements like these that make Disney Crossy Road really new. COLLECT over 100+ Disney and Pixar figurines, including Mickey, Donald, Buzz Lightyear, Rapunzel, Mufasa, Sadness, Wreck-It Ralph, Madame Leota, and other. JOURNEY through 8-bit depictions of Al’s Toy Barn, the Pride Lands of Africa, the Haunted Mansion, San Fransokyo, and more while enjoying 8-bit versions. MASTER special themed challenges unique to each of the worlds, such as weathering blizzards, collecting cherries to earn special power-ups. Hop into the the 8-bit world of Lalotai inspired by Disney’s animated movie Moana! Explore the Realm of Monsters with new figurines like Moana, Maui, Pua, Heihei, and more! Dodge frog monsters, eight eyed bats, and more unusual monsters, plus keep an eye out for water geysers that might shoot you back up to the human world! Although a little laggy when you want players to jump at a certain time, it’s still very awesome. All the extras and powers that the levels have are amazing too, fun for me and my kids!